Chris Garrett, Wilson HS Class of 1992, is a product of Portland public schools. 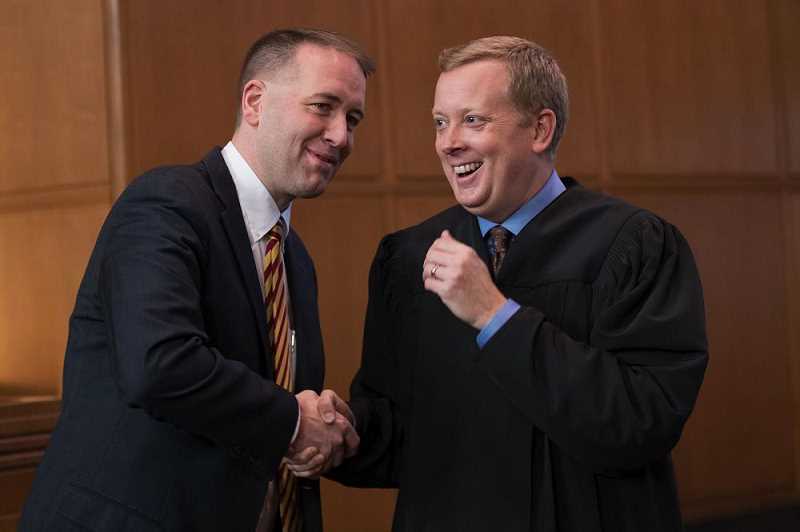 Chris Garrett, who was born and raised in SW Portland and served this area in the Legislature as the Representative from District 38, now sits as one of seven Justices on the Oregon Supreme Court. His appointment to the highest court in the State by Governor Kate Brown was announced on Christmas Eve last year. He's replacing Rives Kistler, who stepped down from the Supreme Court. Garrett will have to run for a six-year term as Justice in 2020. Garrett, a Democrat, was elected as District 38 Representative in 2008 and served from 2009 to 2013 when he was appointed to the Oregon Court of Appeals by Governor John Kitzhaber. He was replaced by Ann Linniger, also a Democrat. She subsequently stepped down in 2017 to take a position as a judge on the Clackamas County Circuit Court. Andrea Salinas is currently the Representative from District 38. His parents were both music teachers, according to Reed Magazine. Justice Garrett responded by e mail to questions from the SW Connection about growing up in Southwest Portland. SW Connection: What were your extra-curricular activities? Do you have any particular memories of teachers or staff members at Wilson who were influential? JG: I played a couple of unproductive years of JV tennis, but my big activity was the school paper, the Statesman -- I got involved as a sophomore and loved it, and became the editor my senior year. Rob Melton was a great faculty advisor for the paper. I was more interested in that than academics, and as a result I was a decent but not great student. I did have some wonderful and memorable teachers at Wilson, however, including Nancy Lee, Ed Basaraba, Connie Person, and Walt Looney (who made the doomed attempt to teach me calculus). SWC: Did you figure out in high school what you wanted to do after graduation as a "career"? Did any field other than Law appeal to you? JG: Near the end of high school I was thinking I'd like to pursue journalism. It was not until a couple of years into college that my interests settled on law and government. SWC: What experiences growing up in this part of Portland have shaped you? JG: Growing up in SW Portland, I believed it was normal to live in a "city" that had trees everywhere and sidewalks nowhere. Later in life I lived in Chicago and New York, where things are a little different. I loved living in both cities, but I constantly missed home. SWC: Where were you living when elected to the House from District 38 in 2008? How would you characterize representing the old neighborhood? JG: I lived in downtown Lake Oswego during the five years that I represented District 38--less than ten minutes from where I grew up. The district includes all of Lake Oswego and the adjacent portions of SW Portland bounded approximately by Capitol Highway. So, when I first ran in 2008, I had the experience of walking door-to-door asking for votes along all the streets where I grew up riding my bike. It was a wonderful district to represent -- people are passionate about their community and their schools, and they are well-informed about government. SWC: Where do you live now? Family? Hobbies? Favorite vacation spot in Oregon? JG: I live in Raleigh Hills with my wife, Lauren, and our children Graham (6) and Grace (5). Graham is a first-grader at Raleigh Park Elementary and Grace will start kindergarten there in the fall. We like to go to the usual Oregon places -- beach and mountains. Our kids are learning to ski and we've had a great time at Mt. Hood this winter. SWC: Any message for those who have known you since you were a kid? JG: Thank You Very Much.